I am grateful that I have a draft of my K'zoo paper. It's 13 pages long and thus needs to be cut, but I'm sure there's a bit of repetition in there that can easily come out. And 2 pages are a long passage of primary text that I won't be reading but referring to. I get a whole stack of final papers from both my classes tomorrow, but I can handle editing and grading at the same time. I'm having a heckuva time concentrating on shaping my K'zoo paper. I'm now convinced it's kind of dumb, but perhaps I'll cycle out of that stage in a day or two. But anyway, the writing process, followed by grading jail starting on Thursday, means that you might not hear much from me this week. By the way, if you missed, Another Damned Medievalist is the host of the blogger meet-up for this year's K'zoo, and it was decided to do the same early morning official meet-up as last year, with some unofficial, less rigidly organized go-out-for-drinks meet-ups throughout the conference. Here's the post where she discussed this. Longstocking's Pippington Gertrude Cottontail McLovin, called "Pippi"
...maybe I'll go do this. Let's see, I'm silly, I love me some stoopid internets humor, I love the kittehs, and -- bonus! -- I can't spell worth a frak anymore because of too much Middle English. Yup, I think I'm qualified. This is how we all feel around here these days. The last two weeks have been utterly exhausting and there's still more exhausting stuff to come, in addition to the usual end-of-the-semester / getting-ready-for-Kalamazoo craziness. And Bullock and I are particularly exhausted because Pippi has decided she's a morning dog. A very early morning dog. She wakes us up at 5:30 now. Anyone have any hints for getting a dog to sleep in later? OK, so I've volunteered to teach my colleagues how to make their blog into something that people outside of RBU will want to read, but that also discusses what's going on here. I also plan on showing them ways of getting it wider attention and readers. Obviously, nothing's guaranteed, but I have some ideas. On the writing front, they should talk about the specifics here but with the framework of the larger problems for higher education in general -- especially public education. They won't get readers and links -- especially not from Inside Higher Ed -- unless what they write speaks to a larger audience. And they should mix posts that speak to fellow academics and general audience readers. On the marketing front, these are the ideas I have: register with technorati; read other blogs and comment on them; send an e-mail to the "Around the Web" editor at IHE when there's a post they might be interested in; register with SiteMeter to see what traffic you are (or aren't) getting; register with a local blog who collects Rust Belt blog links and categorizes them; create a blogroll (which may get the attention of those bloggers checking their links); and....um, what am I missing? It's hard to grow a blog audience overnight, I know, but it's worth a try getting some wider audience, I think. And also, once the trustees sign off on my tenure and it's a done deal, I'll link my colleagues' blog here, so eventually they'll have at least one link! PS -- I've told my colleagues that I have a blog, but I haven't told them which one. Morgan is an enabler. She's gotten me totally addicted to an online word puzzle game called Funny Farm. It's a word association game in which you try to guess all the words in a section of the puzzle, and when you get words that overlap the boundary of that section and another, the new section opens up. But not all the associations are literal or direct -- that's the maddening part. For example, when you start, they give you the center section, which has the theme "on the farm." So when I started, I entered things like "cow," "pig," and "chicken," and they all appeared, along with blank boxes related to them. For chicken, three of those boxes were obvious: "rooster," "hen," and "egg." But what the frak was the fourth, three-letter word. Turns out it wasn't a word at all but an acronym: KFC. Ugh. And "pig" overlapped with the neighboring section on "religions," so of course "pig" connected, ironically in a way, to "Judaism" and "Islam." That was pretty obvious, but a couple of the other farm-religion connections were more groaners. I pretty quickly hit a wall, but then I joined up my puzzle with other people's puzzles, and got some answers and was able to proceed in the new sections and open up even more. But now I'm stymied again. Even Google and Google Sets aren't helping now. I dare you to play and not get addicted yourself. If you want to try it on your own, click the Funny Farm link above and give it a go. If you want to help out with my game in progress or join it up with yours later, use this link to get to my game. If you click on "Save Game" on your game, you get the unique URL for a game in progress. Past mine into yours or vice versa and you'll have a combined game. As long as you have cookies operating on your browser, your computer will save your game after every guess and you'll always come back to where you left off. Anyone want to help me with my game in progress? Or if you just want a few hints to get you going again, follow the link to Morgan's blog and combine your game with some of the links there -- they're not too far along at that point. I'd post another link to my game in progress, but I'm nearing the end and it might spoil some of the fun. Update 2: I have now finished the game. Yeah, I cheated a lot, but I also did a bunch myself. So if anyone just wants to get on with their work and stop obsessing -- as I did -- let me know and I'll send you the link for the completed game. The meta-puzzle answer is a single word, btw, and if you type it in, the text at the top says you've completed the game. Not very exciting. Could it be more awesome? Get yours here. As seen at Age of Perfection. The craziness at the university in the last week has made getting work done very difficult. Great management technique, don't you think? The Provost has finally approved my tenure and promotion. Since said Provost was hired by Pres. Newfangledess, I'm assuming the decision isn't anything he wouldn't approve of as well, and that from here on out things will proceed smoothly, swiftly, and positively in my favor. 1) Rattles her crate to wake us up, usually around 6:30 am; gets ignored for awhile and only let out when she's quiet (so as not to teach her to give *us* commands). 4) "Kills" one of her toys by violently shaking, whipping, and tossing it around the room. I've never known a creature to wake up with such blood lust. Should I be worried? Or should I be thankful that if she does manage to catch a squirrel or chipmunk in our backyard, that she'll finish it off handily, instead of leaving us to put it out of its misery? And speaking of our own little wild kingdom, on our walkies this morning I saw one of the campus falcons kill and carry off a robin. It was both disturbing -- the robin tried to get away and nearly did -- and also kind of cool. Pippi wasn't the least bit interested. Some bird dog. She'd rather get all the squirrels. I just heard today that I'm being awarded one of the four university-wide teaching awards. Since you must be nominated by students, this means a lot to me, especially since a student must be motivated enough to go out of their way to write a nomination application. After that a committee made up of previous winners secretly gathers intelligence on you. OK, not really -- I think they just talk to the chair of your department to get more info or something. At any rate, I didn't even know I'd been nominated, so this came out of the blue in a very frustrating and demoralizing week and raised my spirits immensely. And also, there's a significant monetary award. I was excited even before I knew that, but it was definitely icing on the cake since I'm saving for a down payment on a new car and I'm really, really lusting for one of these in chocolate with silver accents. Maybe now I'll get a cutesy vanity license plate, too. But first my tenure has to be finalized, because it's going to be my tenure reward. New Kid tagged me awhile back for the 6 word memoir meme, and it's been driving me crazy ever since. But, after writing the last post, I figured out the *perfect* 6-word memoir for myself. Granted, all but one word of the following belong to the inimitable Dr. Seuss, but that's part of the point -- it's a literary allusion, see? 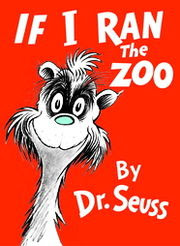 What if I ran the zoo? I'm going to tag two bloggers I know haven't done this yet -- Tommy at Macerating Shallots and also The Pastry Pirate (because I'd like to see her try to fit *her* life into six words! hee!) -- and if you haven't either, consider yourself tagged if you wish. As Bill and Ted would say, things are most bogus and non-triumphant at Rust Belt U these days, my friends. There is chaos at the top and it's pretty much unbloggable, especially since my tenure file still sits in the Provost's office, now weeks overdue for a decision. I'm actually thinking of alternative careers because the atmosphere here is so demoralizing. But back to our most bogus adventures at RBU...I'm trying to work out ways to talk about it, because I want to do so in response to Tenured Radical's call to replace tenure with unionization. The long and short of it is, at our university at the moment, if we had only 5-year contracts and a union, instead of having a tenure system *and* a union, we'd be totally screwed. Well, those of us not in the applied sciences and professional schools would, anyway, and I'd already be working on my pre-vet pre-reqs because I probably wouldn't have a job for next year. Seriously.